What the blurb says: “It is London in the sweltering summer of 1997. Karen is a strait-laced, straight-A university student. When she meets the impossibly glamorous Biba, a bohemian orphan who lives in a crumbling mansion in Highgate with her enigmatic brother Rex, she is soon drawn into their world. As the summer progresses, Karen becomes tangled up in their tragic family history and the idyll turns into a nightmare, culminating in murder. I have to confess that this book has been in my To Be Read pile for months. Having opened it up, I was hooked by the claustrophobic immediacy of the prologue and read the whole thing in a single weekend, cursing myself for not having got to it sooner. After the panicked situation in the prologue, Chapter One starts with conflict of a different kind, Rex is coming home from prison and Karen, Alice and Rex are all having to adjust. As they start to live, for the first time, as a family, Karen finds herself remembering the sequence of events that led to murder all those years before. This is one of those books that gets into your head and keeps you trying to guess what happened. The reader knows that Karen has secrets, things she’s never told anyone, not even Rex. As the 1997 timeline unfolds, Karen turns from disciplined student to bohemian party girl. The writing is so vivid, the descriptions so atmospheric, that you can almost feel the heat on your skin, see the wine in your glass and imagine yourself joining in with the endless house parties hosted by Biba. But as the long, hot summer plays out, and Biba’s behaviour becomes increasingly erratic, cracks, tensions and jealousy cause events in the seemingly carefree household to take a deeply sinister turn. I especially loved the characters of Karen – the diligent student on a journey of self discovery, Rex – the sensible, reliable one who’d do anything for his sister, and Biba – beautiful, neurotic and gifted. As the story progresses, and the events of 1997 return to threaten Karen and her family in the present, the tension reaches its climax and Karen is, once again, pushed to her limits. Like all great psychological thrillers, this story keeps you guessing what will happen right to the very end, and finishes with a shocking dramatic twist. 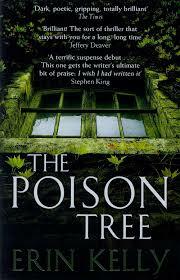 The Poison Tree was a major ITV drama, a Richard & Judy Summer Read in 2011, and was longlisted for the 2011 CWA John Creasy (New Blood) Dagger Award.